I have to admit it was one of those ambivalent moments, kind of like arriving at the the Hundred Steps in Mt. Tabor Park and hearing Kristin say, "OK, ladies, let's go up!" I know it's going to be hard, but when I get to the top it'll feel so good. So when I heard that the tony Pearl district restaurant Giorgio's was opening a tapas bar, called Lolo, on Alberta, I felt a mixture of excitement ("Oboy! The food could be really great!") and dread ("Oh no! There goes the neighborhood."). But I'm here to tell you that everything's copacetic. The low-key vibe of Alberta has not been disturbed by excessively flashy decor or Hummers prowling the avenue for parking. If anything, the large windows of the turn-of-the-century brick facade and the simple tables and chairs cohabit perfectly with the über-funky-but-hip DIY crowd that claims the street as theirs. The menu follows through on this understated approach with three sections to choose from. Tapas ($3-8) are small plates that a party of four can share, allowing you to sample several of these appetizers without breaking the bank. The Raciones, or larger plates ($8-16), like the tapas, can also be shared depending on your group's inclinations, or ordered as entrées. Then there are the Postres, or desserts ($7), small bits of sweetness to end the meal. We chose to go the shared route so we could taste a wider variety of what Lolo had to offer and, to avoid fights, we followed the classic rule requiring that the one who divides the food gets last choice. 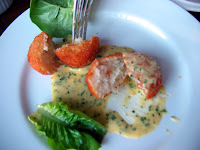 With that agreement in place, we proceeded to mow our way through our choices, beginning with the cod cakes in a pool of bottarga mayo (left). You can see that I barely had time to snap a picture before it was decimated. These little croquettes were so fresh and full of the taste of salt cod that they caused the salt cod fritters at Toro Bravo, which I'd raved, to pale in comparison. 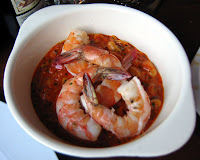 The spot prawns with white beans in a paprika sauce (right) were mind-bogglingly tender and spicy and every last drop of the sauce was sopped up before we let the server remove the bowl. And their grilled summer squash salad with wild lobster mushrooms on a splash of romesco (left, below) was another flavor romp, with the smoky vegetables playing off the fresh greens and deep tomato of the romesco. We also tried the braised chicken with saffron, spinach, pine nuts and currants, and found it just so-so. But the meal ended on a happy note with an unctuous caramel flan with fresh figs that had the parties' eyes rolling back in their heads. There were cocktails from the bar in the corner, and a wine list that was well-selected and priced. We went through two bottles of a Spanish wine made from the tinto de toro grape, a 2005 Liberalia Castilla y Leon, priced at $26 and a fantastic match with the food. The service was attentive and friendly, our waitress chatting in Spanish with two of our party who are fluent speakers, and even when the place got busy (did I mention it was Last Thursday?) she was right there refilling glasses and replacing plates and silverware as the food rolled out. The only fly in this lovely ointment was the sound level, which was high when the restaurant was only half full and reached deafening by the time we left. I don't mean to be a fuddy-duddy who needs her hearing aids turned up, but even our 20-something waitress offered an unsolicited apology and said it was a problem that they were working on. And I'll cut them lots of slack considering they've only been open a week thus far. This kind of food and service coming out of a place this early on only bodes well for the future. Needless to say, we'll be back. Details: Lolo, 2940 NE Alberta. 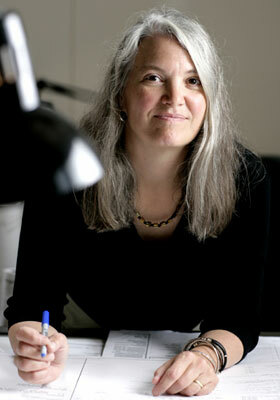 Phone 503-288-3400. Portland is developing quite a spanish food scene. 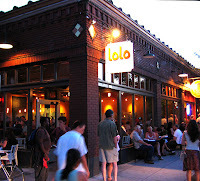 I hear there's one in the works up in NW, on 21st, I believe... Glad to hear a good report on Lolo. This place has been on my radar for a while. Now that it's open, I'll have to give it a look. As for the noise thing, there's an old trick that few restaurants here would seem to have been hipped to, which is to glue some old shag carpet to the undersides of the tables, to absorb some of the sound as it bounces up from the floor. Now I don't know from restaurant design, but I've been told it actually works. I've heard about the carpet trick but I'd think it'd get gross after awhile (spills, gum, etc.). 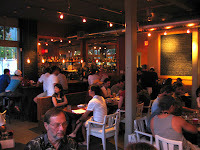 But putting that lovely picture out of our minds, let us know what you think after you go to Lolo!